PEORIA, Ariz. — In the span of five hours on Jan. 25, 2018, the baseball fortunes of the Milwaukee Brewers, and specifically Domingo Santana, changed drastically in opposite directions. For the Brewers, a team that was trying to finalize a three-year rebuild project and take a step forward in the National League Central, it was franchise-altering for the better. Early on that Thursday morning, general manager David Stearns completed a trade to acquire All-Star outfielder Christian Yelich from the Marlins in exchange for four players. About four hours later, the Brewers reached an agreement to sign All-Star outfielder Lorenzo Cain to an $80 million contract. They were astonishing moves that would pay immediate dividends as Milwaukee made the playoffs with Yelich and Cain both making the All-Star Game and Yelich also winning the National League MVP. But for Santana, that five-hour span meant a relegation from being starting outfielder, who had 30 homers the year before, to a part-time player coming off the bench. With Yelich, Cain and veteran Ryan Braun in left field, there was nowhere for Santana to play on a consistent basis. Eleven months later, Santana’s baseball life changed for what he hopes is the better as the Mariners acquired him from the Brewers in exchange for outfielder Ben Gamel. “For me, in my career, I was really excited about the trade,” he said. Santana was a fan of Alex Rodriguez growing up and remembers watching A-Rod with the Mariners. He wanted to be shortstop just like A-Rod. For Santana, the trade to Seattle represented a new opportunity and a chance to be more than a fourth outfielder. The Mariners acquired Santana to be their every day left fielder in hopes he could revisit his 2017 production numbers when he posted a .278/.371/.505 slash line with 29 doubles, 30 homers and 73 RBI. He won’t be platooned with Jay Bruce. Santana will see the bulk of the time in left field. “Jay Bruce will play some first base, Jay Bruce will DH,” manager Scott Servais said. Admittedly, Santana struggled with the reduction in playing time last season. While the Brewers were winning, he never really adjusted to coming off the bench and playing sparingly. His early numbers last season reflected his struggles in adjusting and understanding his new role. He posted a .249/.313/.354 slash line with 11 doubles, three homers, 17 RBI, 18 walks and 69 strikeouts in 67 games to start the season. Because his playing time was limited, he overthought each at-bat and overanalyzed each performance. The Brewers eventually optioned him to Class AAA Nashville, where he posted a .283/.401/.487 slash line with 10 doubles, two triples, eight home runs and 35 RBI in 55 games. He returned as a September call up, appearing in 23 games and posting a .403/.458/.909 slash line in 24 plate appearances with three doubles, a triple, two homers and three RBI. Santana came to Mariners and has shown signs of that 2017 production. He came into the Seattle game Wednesday hitting .467 (7 for 15) with a .529 on-base percentage, a double, three homers and seven RBI. And later that night, he hit his fourth homer of the spring. All four of his homers have all been impressive towering moonshots that seem fitting for his 6-foot-5, 230-pound frame. The biggest issue for Santana this spring is the conversion to left field. — a position he’d never really played before. He’d been a primarily a right fielder and center fielder in his time with the Astros and Brewers. Santana has looked more than capable in left field thus far into spring. 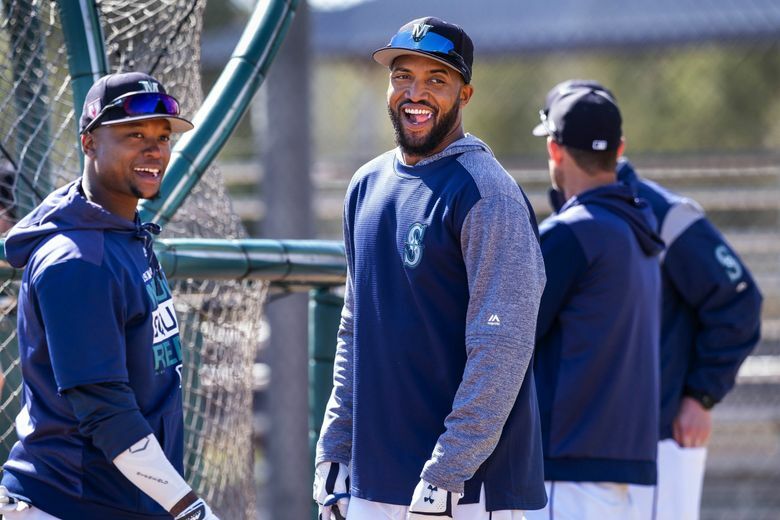 The up-and-down 2018 season for Santana did provide something that he hopes to reach with Seattle — an appearance in the postseason.